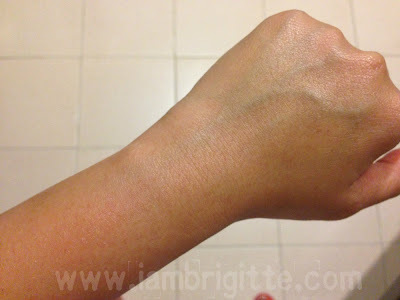 When I stayed in the US for a month, the one thing that I definitely noticed is that my skin became dry. It's so dry that I would feel a bit of itchiness at times. I brought with me some lotions that I've been using in the Philippines but they didn't really help. I had to reapply every after a few hours and even resorted to applying some petroleum jelly to relieve the dryness. 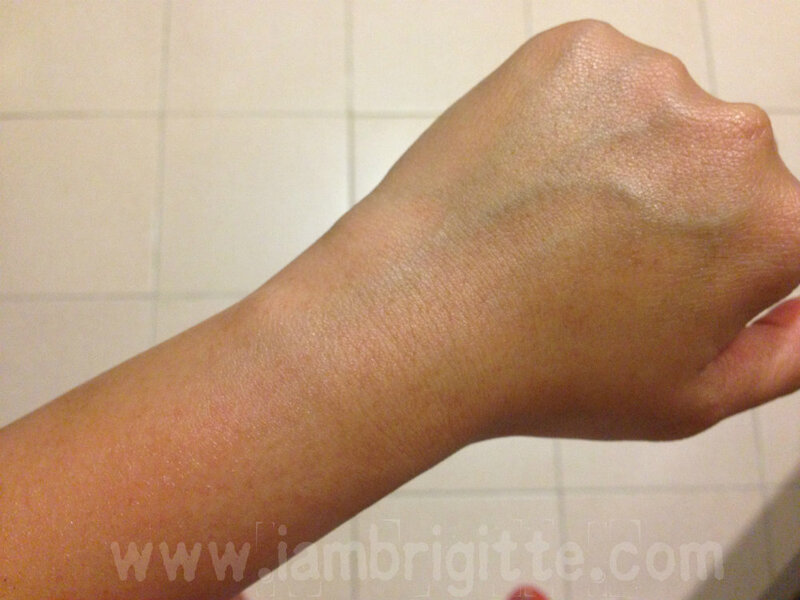 When I arrived here in Dubai, I thought my skin would be able to recover. It didn't. It actually got worse since I'm inside an air-conditioned room all day. Taking a warm, sometimes hot shower doesn't help either. I even developed rashes. 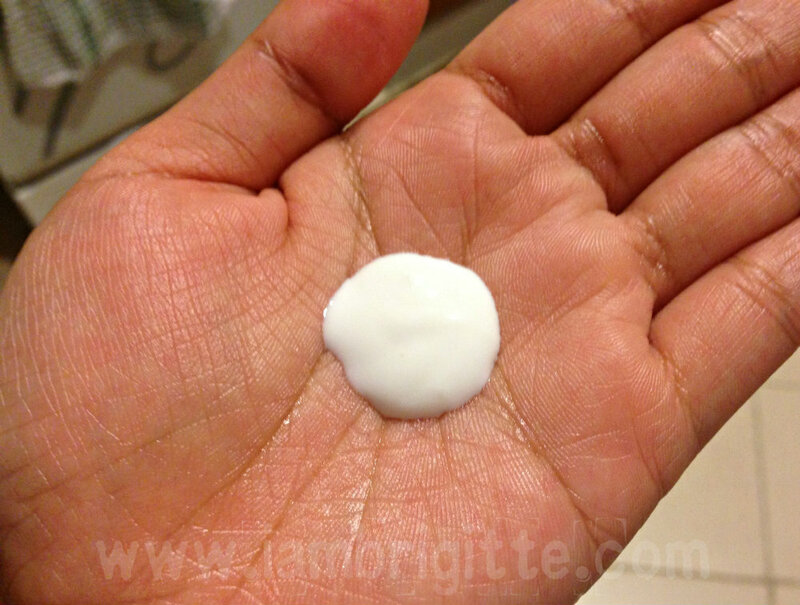 To give me temporary relief, I again turned to using Petroleum Jelly. But I find it too sticky, warm and heavy even on a really dry skin like mine. And not to mention, how icky I'd feel when I go out and be under the scorching heat of the sun. So nah, I need to find a lotion that would give me all the moisture I need without the sticky feeling. 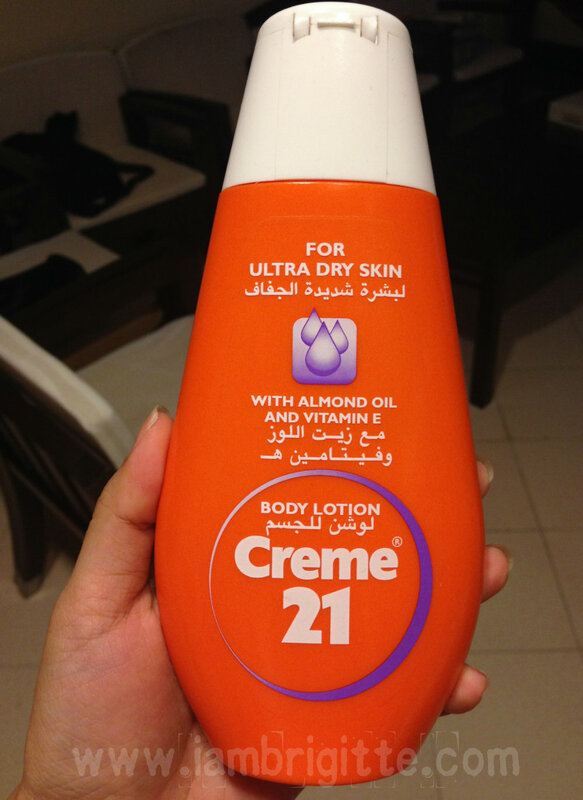 Creme 21 for Ultra Dry Skin protects your skin from dehydration and adds vitamins. With natural Almond Oil, combined with further rich nourishing emollients, it offer protective care especially for ultra-dry skin. In addition, with Vitamin E, it moisturizes and protects the skin from harmful environmental effects. The rich, high quality formulation makes your skin every day touchably and visibly soft and supple. It looks naturally healthy and beautiful all day long. 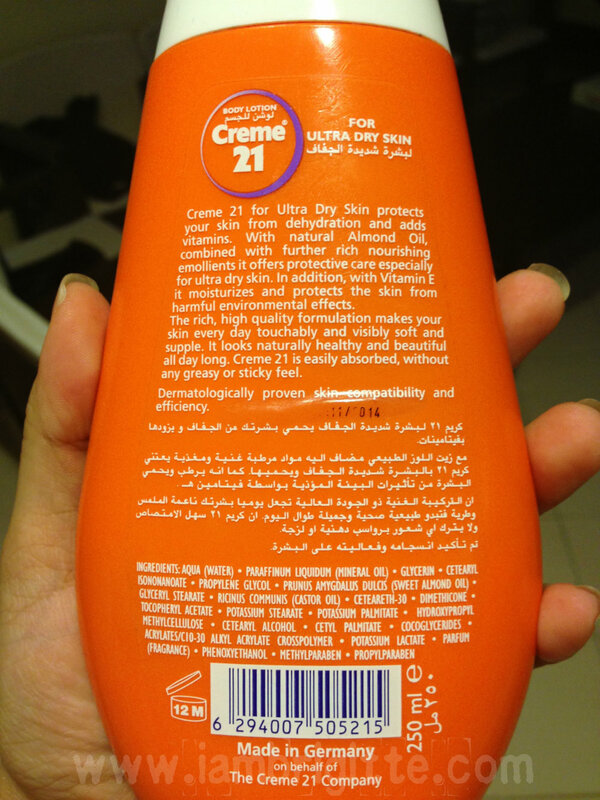 Creme 21 is easily absorbed without any greasy or sticky feel. Dermatologically proven skin compatibility and efficiency. The product is made in Germany and when I checked out their official website, it turned out that they do have a lot of skincare products: shower creams, shower gels, sunblock, body creams, wipes and all other types of lotions. They even have a lotion that has shimmer for that instant highlight! I only get to see the body creams and the usual lotions like this one in the supermarkets I've gone to here in Dubai. I'm not really sure if all of their products are available here though. It would be nice to be able to try more from this brand. And ohh, they have a sunblock spray too! The consistency of this lotion is like milk. A bit thicker than usual lotions you might be used to, but it is still easy to apply on the skin. At contact, skin feels immediately relieved from dryness. I really love this lotion. I actually look forward to taking a shower and using this after. See how supple and moisturized my skin looks? I also love the subtle sheen it gives. And the sweet scent, too! 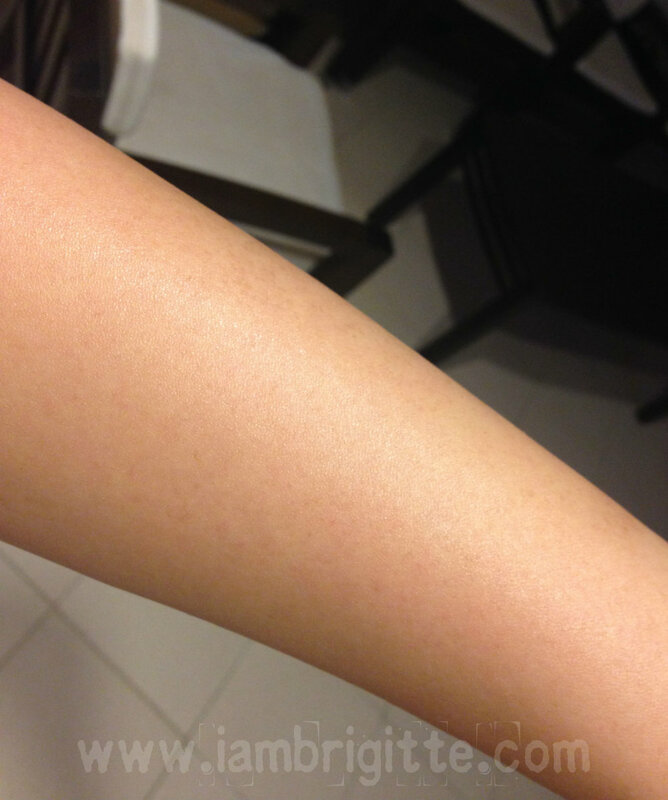 There are some lotions that give you skin softness after using them, but doesn't really stay long. This one does. I apply this after taking a shower around 5pm and skin is still soft the following day. No need to reapply! This one has no SPF so I still use a sunblock on top after applying this if I am going out. And yes, no sticky/greasy feel. Fairly priced at AED14 for a 250ml bottle. I bought mine at the grocery here in the building where I live so I'm thinking it's even cheaper when bought at the supermarket or department store. My skin feels and looks smoother too. It doesn't have SPF, so I still need to put sunblock if I'm going out. 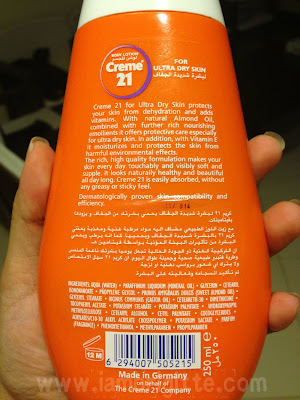 This isn't the first time I came across Creme21. I remember a fellow Gtalker back in the Philippines gave me the body cream a few years back. I used it on my elbows, knees and heels and it works great too! I'll probably get that one soon. Hopefully all other products from this brand are available here in Dubai. It would be really nice to try them, most especially their shower creams/gels which I am such a sucker for. great review!I've been seeing this in Lulu and didn't know it's good.